A recent survey has revealed that Indians are posing a serious threat on the road with 3 in every 5 admitting using mobile phones while driving. Of this, North India leads with 62% compared to South with 52%. At the same time, only 1 in 4 Indians have admitted that they have been caught by cops breaking this law. Over-speeding additionally posed another problem as 60% of respondents admitted to over-speeding in Kerala, followed by 51% in Delhi, and 28% in Punjab. 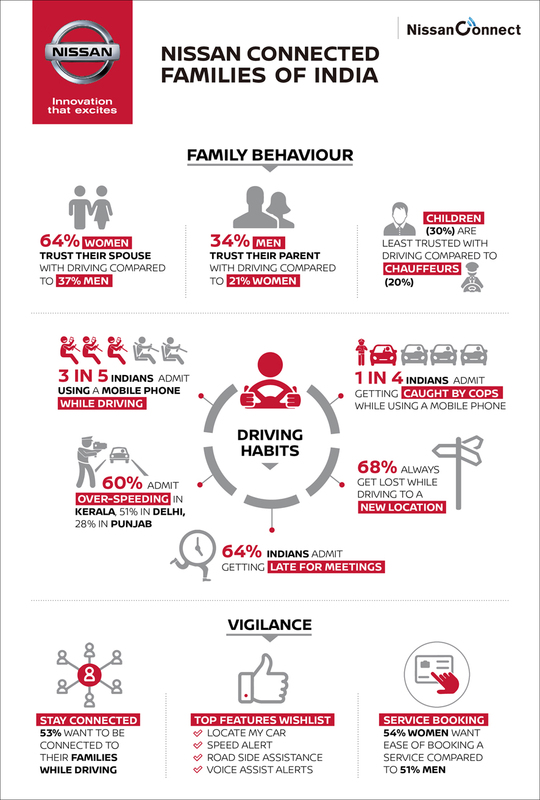 Conducted in collaboration with Nissan India and Kantar IMRB, the Nissan Connected Families of India survey deep dives into the day-to-day driving habits of Indians across 20 States, ranging from over-speeding, phone usage, punctuality and vigilance to trust. When it comes to trust, a large percentage of women respondents (nearly 64%) trust their spouse when it comes to driving, as against just 37% of men who could say the same. Children, however, scored consistently low on the trust score with 30% respondents rating them the least. The survey also identified the increased need for vigilance as respondents (72% in Tamil Nadu, 70% in Kerala, 57% in Punjab and 66% in Delhi NCR), said that they would always want to monitor their children while they are driving. “At Nissan we keep the consumers at the heart of everything we do. As a part of Nissan’s Intelligent Mobility, we have introduced NissanConnect to make the car more responsive. Equipped with 50+ features to ensure safety, security and convenience, NissanConnect is the 1st and only telematics control unit based Connected Car Technology in the industry,” he added. Apart from trust and vigilance, the survey highlighted interesting patterns in India’s driving habits. About 68% Indians confessed to always getting lost while driving to a new place, often leaving their families worried and anxious. Moreover, nearly 64% of the respondents admitted to getting late for meetings. This trend varied from North to South, as 65% respondents in Kerala conceded to failing in keeping time commitments as opposed to 48% in Punjab.